We are a full-service Energy Star Replacement Window Company providing quality service & materials to existing residential homes including Memorial, Sugar Land, Katy, Houston, West U, Bellaire, Woodlands, Spring, Tomball, Magnolia, 1960 Area, Mid Town, Kingwood, Fulsher, & Clear Lake. From remodeling to new construction, from a living room in a historical property to a high-tech office, our expert technicians are dedicated to working with you to implement a solution that meets your needs. We are known for our high quality installations & neatness with thousands of happy customers over the past 30 years. Make the call today and you can be another satisfied customer. Cambridge is here to help you budget, plan, and make the perfect Energy Efficient window purchase for your home. Replacement Windows and Doors can pay for themselves in just three to five years ...without the rate increases.....now that the increases are coming..........there's never been a better time to seek out options for saving energy dollars. 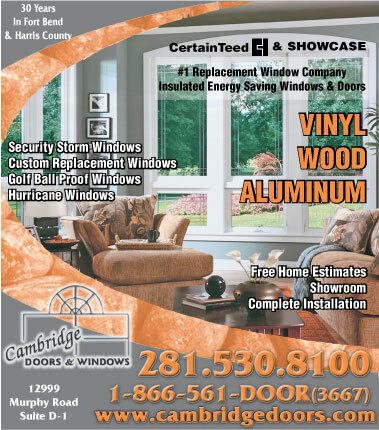 Cambridge Doors & Windows is a factory direct dealer with out the middle man. Call us today for a no-obligation consultation. We pride ourselves on the ability to help you get the products you need at a price that fits your budget. We install all of our products with our in house professional installation team. If Quaility is important to you, call Cambridge Doors & Windows. We do it right the first time. No Subcontractors. We are fully licensed and insured. We aim to make you proud of you home once again. We except all major credit cards and work with local banks for your home improvement loans. We provide FREE ESTIMATES...give us a call to set up an Appointment to make your Home more Energy Efficient today! Exclusive special offers, new products etc. 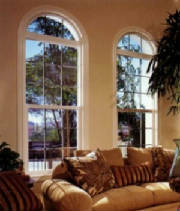 Click here to view Cambridge Doors & Windows main web site. Members of The Greater Houston Builders Association, The Greater Houston Remodelers Association, & The National Builders Association.